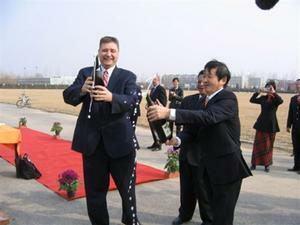 BEIJING, CHINA -- (MARKET WIRE) -- April 5, 2007 --As the melody of America's national anthem echoed across a field in Beijing, China, a flag that had once flown over the nation's Capitol slowly rose marking the opening of the Groundbreaking Ceremony for Future House USA. Part of China's landmark "Future House Community" project, Future House USA will demonstrate the latest advances in energy efficiency, environmental compatibility, and sustainability. The Future House project was established by the People's Republic of China as part of that nation's ongoing effort to address its environmental problems and skyrocketing energy demand. Future House USA is one of ten homes, each being built by a different nation, in conjunction with the 2008 'Green' Olympics, to be held in Beijing. The US entry is being built by a consortium of three institutions: The Alternative Energy Living Foundation, the Florida International University, and the National Defense Council Foundation. The structure will be one of the first to fully integrate a wide variety of energy and environmental features in a manner that achieves substantial energy usage reduction, will virtually eliminate indoor air pollution, sharply reduce water consumption, and filter storm water. Mr. Lin Yu, Chairman of the Board of Future House Real Estate Co. Ltd., China, called the Future House USA "An important beginning towards building a bridge between USA and China in the area of sustainable construction." In particular, he emphasized the unique nature of the house adopting "an integrated environment-conscious approach." Mr. Wang, a Director from Ministry of Construction, China, agreed and congratulated the US team's effort in bringing new technology and sustainable construction practice into China. Mr. George Bialecki, Jr., who developed the Home Biology 101 building approach used in Future House USA, established the Alternative Energy Living Foundation. 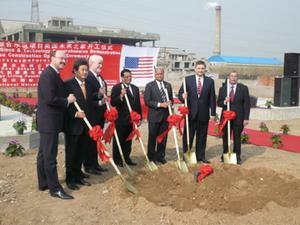 As project director, he noted, "Across the globe, we all breathe the same air and drink the same water. It only makes sense that we all work together, as One World to resolve our environmental concerns." Dr. Vish Prasad, Executive Dean of Engineering and Computing, representing FIU as the founding academic sponsor, cited the project as one of FIU's most important international ventures. Dr. Yong Tao, FIU's nationally acclaimed expert in alternative energy technology, praised the unique collaboration that "Transcended national boundaries and political division" to make the future house project a reality. Mr. Milton R. Copulos, President of the National Defense Council called the project "a historical first step towards a sustainable future." Mr. Val Huston, Foreign Commercial Service Officer, US Embassy, passed congratulations from US Ambassador Randt and Dr. Kincard passed congratulations from President Madique. The advanced environmental and energy efficiency features that will be showcased in Future House USA include such things as structurally insulated panelized construction (SIPS), geothermal heat pumps, an advanced storm water management system, photovoltaic panels, enhanced indoor air quality, water conservation devices, gray water recycling, non-toxic materials, and technologies to mitigate electromagnetic emissions. Mr. Bialecki added, "It is not only a must for the United States to be represented in this global collaborative effort, but most importantly, Future House USA must be focused on showcasing a home that will unify the international community in our collective search for housing and energy solutions." Future House USA will be completed about one year before the 2008 Summer Olympic Games and is expected to host as many as 5 millions visitors over the life of the project. For more information on FHUSA, please visit us on the web at www.futurehouseusa.org or contact lewis@futurehouseusa.org.